Larrie Howard began violin studies at the age of 4 with her mother, who was her teacher until graduation from high school, when she entered the Oberlin Conservatory of Music. She received both Bachelor's and Master's degrees in performance from Oberlin where her teachers included Mischa Mischakoff and Andor Toth. 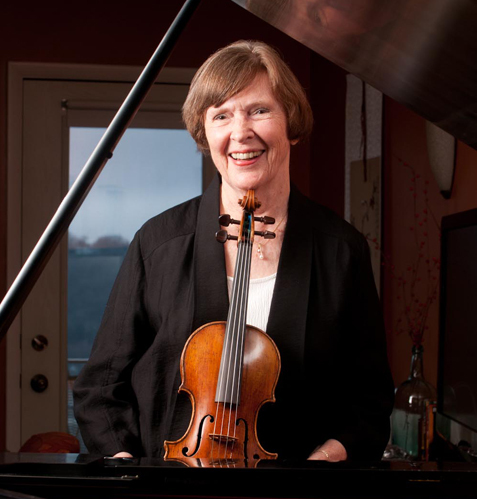 During her years as a graduate student Ms. Howard was violist with the Oberlin Faculty String Quartet, as well as an adjunct violin teacher on the faculty. Upon graduation, she joined the National Symphony in Washington, D.C. Ms Howard joined the Cincinnati Symphony Orchestra in 1968 where she enjoyed a 37 career as a member of the first violin section. For many years she was the violinist in the Symphony String Trio, which toured extensively. She also played frequently on the Memorial Hall Chamber Series as well as in other chamber music concerts. She also has a large studio of violin, viola and piano students, both youngsters and adults. One of the original members of Ensemble Sans Frontière, she has performed and recorded premiere performances of Frank Proto's Trio for Violin, Viola and Double Bass, Duos No. 1 and 2 for Violin and Double Bass, Quintet for Piano and Strings, Sextet for Clarinet and Strings and Reflections - Music for Viola, Double Bass and Stereo Tape, Sonata for Violin and Piano and String Quartet No. 1.